LendingTree Analysis Reveals Where Homebuyers are Stretching to Buy | LendingTree, Inc.
CHARLOTTE, N.C., Sept. 6, 2018 /PRNewswire/ -- LendingTree®, the nation's leading online loan marketplace, today released a study on where homebuyers are stretching the most to buy a home. A well-known rule of thumb says that the home price should not exceed three times the buyer's annual income. When a mortgage is used to buy a house, the ratio of amount borrowed to income is the extent to which a borrower is leveraged. 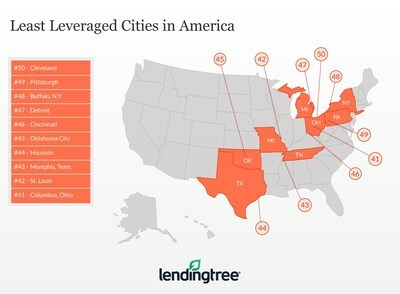 This study compares leverage ratios across cities to see where borrowers are stretching the most to purchase a home. The study used Home Mortgage Disclosure Act (HMDA) data that includes over 7 million mortgages originated in 2017 to calculate the leverage rate of borrowers in the 50 largest cities in America. The median amount borrowed was divided by the median borrower income for all purchases in the HMDA database for 2017. "Home prices continue to reach new highs, with the most recent data showing prices for existing homes at a median of $276,900 in June; new homes are even more expensive at a median of $302,100," said Tendayi Kapfidze, Chief Economist and report author. "The annual increase in home prices has been outpacing income growth since 2012. As a result, homebuyers have been stretching more and more to purchase their dream homes. Low interest rates have masked this to some extent, as they have subdued the monthly payment, but the recent increase in interest has reduced this mitigating factor." Kapfidze continued, "Historical data shows that nationally leverage ratios increased from 2.30 in 2014 to 2.56 in 2017 as home prices rose faster than incomes. To rank the cities, we calculated leverage ratios that show how the median homebuyer in each city fared. However, each borrower is unique, and their homebuying capacity depends on additional factors including credit scores, other debt currently held and down payment." 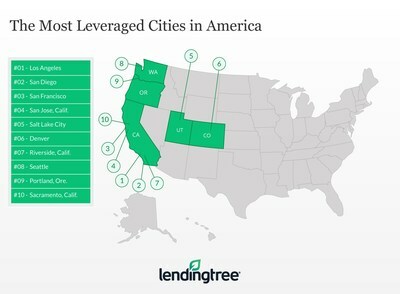 To view the full report, visit: https://www.lendingtree.com/home/most-stretched-homebuyers-in-america/.